This award honors an individual or family with a proven record of exceptional generosity, civic, and charitable responsibility demonstrated by significant financial contributions to charitable organizations within the Hampton Roads region. This award honors a nonprofit organization with a strong development/fundraising program. Nominee has developed successful and creative campaigns, has a strong infrastructure, and a deep commitment to best practices and ethics in philanthropy. Nominee’s work must be focused in Hampton Roads, i.e., raised from and have a considerable impact on the Hampton Roads community. Nominee must have been a 501(c)(3) for a MINIMUM of 5 years. At least one of the nominee’s staff must be a current AFP-HR member. This award recognizes an individual 45 years of age or younger for their exceptional generosity and civic responsibility demonstrated through financial contributions and volunteerism to charitable organizations within the Hampton Roads region. 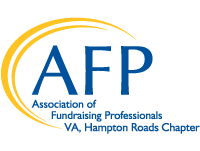 This award recognizes a person who provides exceptional leadership in coordinating fundraising projects or activities for a charitable organization or cause, with a preference for community work that has a direct impact on the Hampton Roads region. This award honors an outstanding individual fundraising professional who works for a nonprofit, charitable organization. Nominees must have a MINIMUM of 10 years of experience as a professional fundraiser. Nominees must be a member of AFP to be eligible for this award. This award recognizes a foundation, corporation, or corporate foundation whose gifts and charitable activities enrich a community within the Hampton Roads region. This award recognizes a community organization or group that demonstrates exceptional generosity and community impact through significant financial contributions and volunteerism to charitable organizations in the Hampton Roads region. Nominees must have been a qualified nonprofit organization for a minimum of five (5) years. We invite you to submit nominations for these prestigious awards by Wednesday, May 15, 2019 at 5:00 pm. Please submit nominations online here (requires Google log-in), or email completed forms and attachments to info@afp-hr.org, Subject: AFP Philanthropy Day Awards. Questions? Please contact National Philanthropy Day chair Kate Wilson at kwilson@hamptonroadscf.org or 757-622-7951.